﻿CORVALLIS, OR - A bright blue compound that was first discovered by accident seven years ago in an Oregon State University laboratory - and has since garnered global attention - has now led to the more rational and methodical development of other colors that may ultimately change the world of pigments. Findings on the newest pig-ments, in shades of violet and purple, were recently published in Inorganic Chemistry, a journal of the American Chemical Society. More important, researchers say, is that progress made since the first acciden-tal discovery of this family of inorganic compounds has allowed intensive science to take the place of luck. What’s emerg-ing is a fundamental understanding of the chemistry involved in these “trigonal bipyramidal” compounds. As the basis for pigments, they are quite remarkable. Compared to the flaws that exist in many of the compounds they replace, they are all thermally stable, chemically inert, nontoxic and noncarcinogenic. For commercial use, they also have the extraordinary characteristic of reflect-ing heat, which is highly unusual for dark colors and potentially of great value for saving energy. All of the compounds have been pat-ented and are being developed commer-cially by a private company. Yellow, green and orange colors have already been cre-ated, along with the original blue. 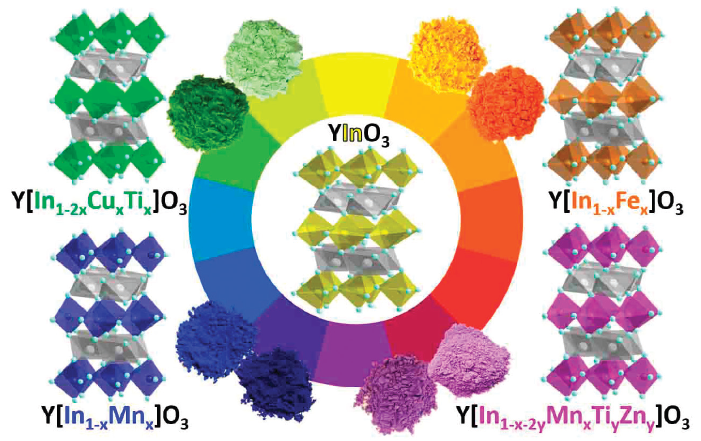 These developments began in 2009 when OSU researchers were studying some manganese oxide compounds for their potential electronic proper-ties; when one compound came out of an extraordinarily hot oven - about 2,000 °F - it had turned a vivid blue, now known as YInMn blue. The scientists noticed and took advan-tage of this unexpected result. They used the compound to create a pigment that was environmentally benign, resisted heat and acid, and was easily made from readily available raw materials. “No one knew then that these com-pounds existed,” said Mas Subrama-nian, the Milton Harris Professor of Materials Science in the OSU College of Science and corresponding author on the new publication. Along with blue, Subramanian said, a stable, nonorganic red pigment would have huge commercial demand. In this process, the OSU researchers are opening the door to new, inexpensive types of pigments that leave behind some of the toxic compounds historically used to create colors - lead, cadmium, mercury, even arsenic and cyanide. And the bonus of solar heat reflection has huge value for many applications, such as building construction or vehicles, where this char-acteristic can reduce cooling expenses and something other than white is desired. Applications of the new pigments include high-performance plastics and coatings, building exteriors, cool roof-ing, vinyl siding, automobiles, and even art production or restoration. The National Science Foundation sup-ported the research.